But look. Here’s Topel. The smoker’s tooth polish. What I like about my titles is they’re starting to make less and less sense. So I was just in my closet, because who doesn't like to just stand around in their closet? What? Okay, I was putting away clothes, because with Marvin home for the summer it's like I have a little butler. It's like Mr. French is here. Did Mr. French do laundry? You never saw him lugging hampers, did you? He was always just setting out the favorite drink for whichever bland woman Uncle Bill was gonna bring home that night. Mr. French was a total pimp. Really, why did Uncle Bill have such terrible taste in women? They all had those dreadful bouffants and little business suits going. Like, this is what you're gonna do to your appearance when a rich guy like Uncle Bill asks you out? Let your freak flag fly, there, sugar! Let 'em hang! Show Uncle Bill what he's missin'! That'd be the kind of stylist I'd have been in the late '60s. 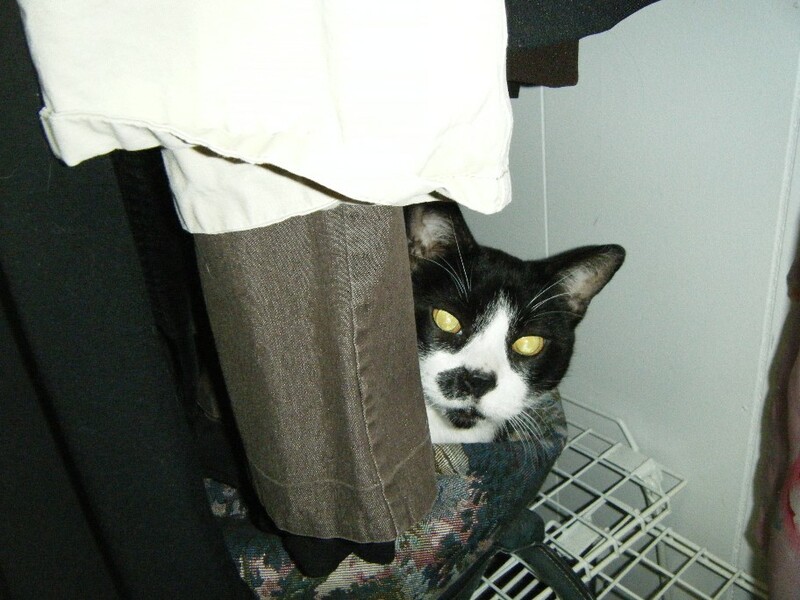 I was IN THE CLOSET, putting away CLOTHES, when I heard–was that?–who?–is that purring I hear? I pushed aside the clothes and found this. Francis can't seem to shed his baggage and come out of the closet. Seriously. That cat is on his pink chair for six months in a row and then suddenly he'll appear somewhere weird like that. I'll bet it took him two hours to waddle from the pink chair to my closet. His eyes look a little rheumy, don't they? Do you think he's getting cataracts? That's what he needs. Another issue. And I realize Dr. Quinn Medicine Woman called and wants her satchel back. My Aunt Mary gave me that bag for my 30th birthday, and I will be 44 in two weeks. Need luggage. Stat. How bad do you hate me for saying "stat" right now? You know what else I wish we'd all stop saying? Veggies. Vegetables only has one more syllable, unless you're Mrs. Bridges from Upstairs/Downstairs, who called them veg-e-ta-bles. But you probably aren't Mrs. Bridges from Upstairs/Downstairs. Seeing as she was a fictional character. So, could I trouble everyone to just use the real term? Are we that close of buds with all vegetables that we need a cute nickname for them? Okay, I seriously logged on here to tell you something. And that is this. Go look at this video on People.com. It's the many faces of Michael Jackson or something. Look at it several times. Concentrate on one feature per viewing, like look at how his eyes change. Then look at his jawline. It is riveting. Also, too, Barefoot Foodie is frigging hilarious today. Yes, I got hooked on Barefoot Foodie during this endless Funniest Blogger competition. How many links can I put in this paragraph? I am Art Linkletter. I am Juneaham Lincoln. Someone stop me. I am Linc from The Mod Squad. How many TV shows can I mention in this post, really? Waste your youth much, there, June? I will end this useless post (but, really, if you link to either thing up there, Barefoot Foodie or People.com, your time here was not wasted) with the Obligatory Henry Picture. Previous Post The crows seemed to be calling his name, thought Caw. Again! Freaking hilarious! I’ve gotten hooked to both you and “barefoot foodie” because of the contest too. Thanks for reminding us all that having a Dr. Quinn bag is ok, just as much as having an Uncle Bill or Aunt Mary (which I have). For a much nicer (and dare I say less self-centered) take on summer than Barefoot Foodie’s, go to http://www.megduerksen.typepad.com/whatever. She’s also nominated for a blog award of some sort — best eye candy, maybe. But the pictures are marvelous. I always thought Cissy and Uncle Bill had chemistry. I know that’s sick. And of course, mom of hyphens, my votes went down, too! Everybody cheated. Well, except me. Because I wasn’t smart enough to figure out how to do it. I can’t do BUTTONS. I think Cissy and Mr. French were gettin’ it on. Do you suppose that Henry’s presence has jolted Frannie back to wanting to be in the world? You said that he and Horkie were inseparable, so maybe he’s feeling more confident again with Henry there? I dunno. That’s how it happened with Koty. Once Sadie moved in with us, he turned over a new leaf and was a puppy again! And the MJ video was fascinating. And Barefoot Foodie hit the “summer” nail on the head! Very funny post! Thanks, June! Okay, my cat does this! I call it her spot of the week, though she sometimes stays in one spot for more than a week. Then BAM! She moves to another spot and there she will be until she feels the need to change! It is hilarious! Her spot of the week THIS week is on top of my suitcase in my bedroom. She got up on it when we came in from the beach on Sunday…she is still there! I did put a beach towel down on there to make it a little more comfortable for her. After all, she is 13! So until she changes spots, I ain’t movin’ the luggage! Love your blog and read it everyday! I’m with you on the “veggies” and my peeve is this “you guys” thing that seems to be so prevelant. I HATE it. It is YOU. Even if it is more than one person. YOU. YOU. YOU……..
You are one very funny lady!!!!!! I just spent thirty minutes rerunning the MJ video. Who knew? My Grandmother bought me the complete collection of the “Buffy” clothing line. I had a round pink patent leather suitcase and a red mini dress with studded navy patch pockets and big ring pull zipper collar. Wore it with white go go boots. I was one hot 8 year old. I should have dated Jody. Or Unca’ Bill when he was wearing his martini goggles. JuneBug!…..you are so BOUNCY BOUNCY today…kind of like Tigger…is this what you look like OFF Topomax?…..have they found something better for your migraines…or are you cured?….Love ALL of your LINK-Y-Do’s!! !…especially the reference to Linc on Mod Squad….that takes me back…remember the tune?…oh…and the “one white…one black….one blonde”…coulnt get away with that now ( oh…er…maybe they could)!! 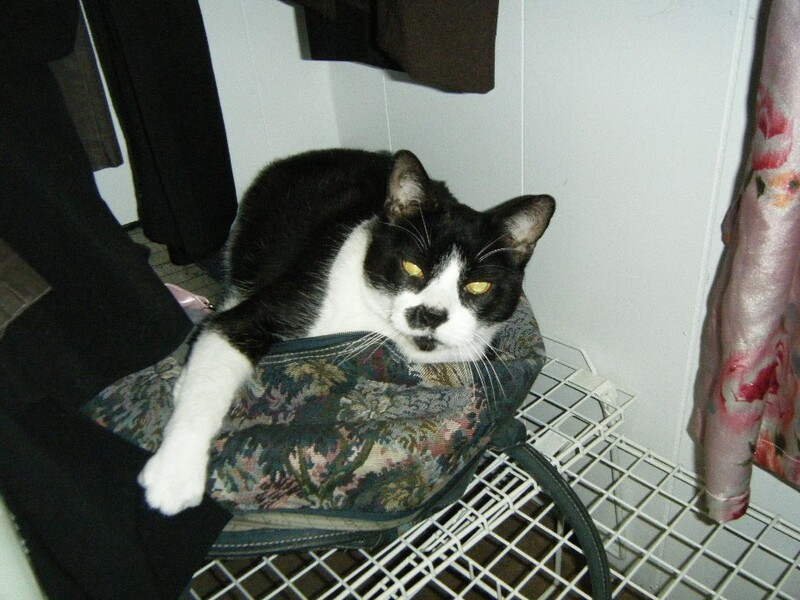 I don’t know why I didn’t notice that Francis was a Kitler, but he is and he even has a matching soul patch. He’s so cute. And Henry always brings a smile to my face, such a sweet little guy. A few years ago my sister came to stay with us for what was supposed to be a month. Of course, since she’s family and we don’t get a long, it ended up being a year. She also brought with her one impossibly cranky cat. That cat HATED my cats with a passion. It took him two days to find a shelf in the guest room closet and once he settled into that spot, that cat NEVER moved. We had to pull him down for grooming and play time- which was more like him meowing how much he hated us time but whatever. We tried. Later that year over a dinner at home with friends we mentioned something about having three cats. One friend didn’t believe us. “I’ve never seen three cats here!” Yup, there’s one that lives in the guest room closet. Wine in hand all the guests tromped in there to see what what has been referred to since that night as “The Legend of Grampa Whiskers.” I don’t know why I’m telling you this. I guess I just hope that Francis doesn’t turn into a closet squatter. One more thing to worry about, I know. We used to go to this restaurant that served wice and wedgie whistles. Now see I was such a warped child I had crush on Mr. French not Uncle Bill. Oh dude. I think you should have the contest wrapped up after that one. Signed, TRAILING BY A LONG MARGIN. Poor Francis. Yeah, I was going to say it looks like he doesn’t even have pupils. Poor baby. 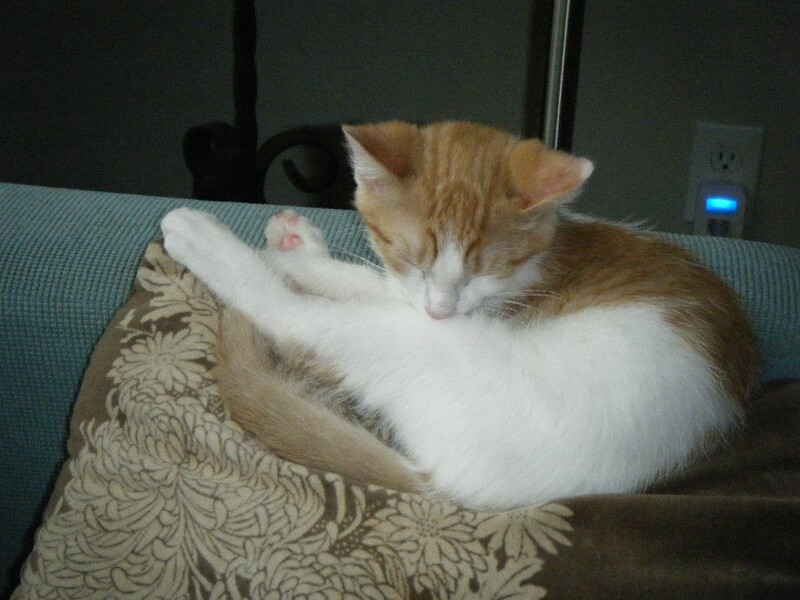 That is just so adorable that he was discovered because he was purring. Tell us more about your manservant. I want one. I am still bummed that Buffy killed herself. I even had her cookbook. Mr. French was the best. Awwww Fran has found a great hiding place. I found Oscar Snuggles, King of Tidewater under the twin bed in one of our guest bedrooms this morning after an extensive search for him! They change spots from time to time. I can not imagine the dreadful pain MJ has suffered to change the look of his face. How many times do you suppose he has had the bones in his face broken? Loved the photo of King Henry. Hopefully Fran is planning on staying in that closet until next Monday. Henry…ohhhhhh.